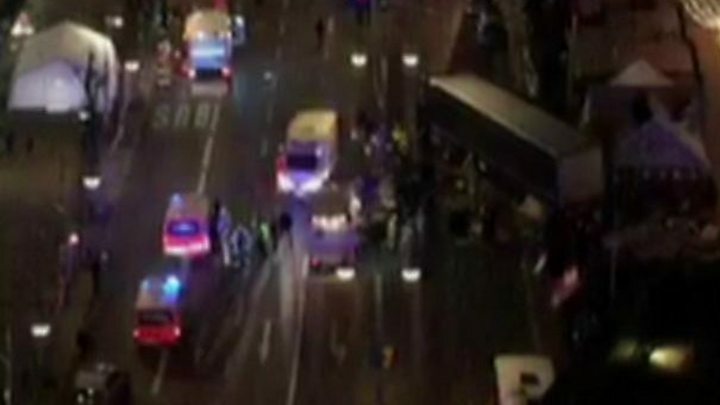 An articulated lorry has ploughed into a busy Christmas market in the heart of Berlin, killing 12 people and injuring 48. Germany's Interior Minister, Thomas de Maiziere, said "many things" pointed to a deliberate attack. The market is at Breitscheidplatz, close to the Kurfuerstendamm, the main shopping street in the city's west. Facebook set up a "Safety Check" page for people in Berlin to let others know they are safe. Berlin police spokesman Winfried Wenzel said a suspect believed to be the person driving the vehicle was picked up about a mile (2 kilometres) away from the crash site, near Berlin's Victory Column monument, and was being interrogated. Media captionEyewitness and British tourist Emma Rushton: "There's no way it just veered off the main road"
Images of the lorry show that it was registered in neighbouring Poland. Police believe it may have been stolen from a construction site there. Police said the passenger who died was Polish. Ariel Zurawski, the Polish owner of the lorry, confirmed that his driver was missing and had been unreachable since 16:00 (15:00 GMT) on Monday. "We haven't heard from him since this afternoon," he told the AFP news agency. "We don't know what happened to him. He's my cousin, I've known him since I was a kid. I can vouch for him." German politicians have been unwilling to call the deadly crash a terrorist attack at this stage, while many of the details remain unverified or unclear. Interior Minister Mr de Maiziere told ARD television: "I don't want to use the word 'attack' yet at the moment, although many things speak for it. "There is a psychological effect in the whole country of the choice of words here, and we want to be very, very cautious and operate close to the actual investigation results, not with speculation." Chancellor Angela Merkel has been briefed by the interior minister and the mayor of Berlin, her spokesman Steffen Seibert tweeted. "We are in mourning for the dead and hope that the many injured can get help," he added. German President Joachim Gauck said in a statement that Monday was an "awful evening for Berlin and for our country". 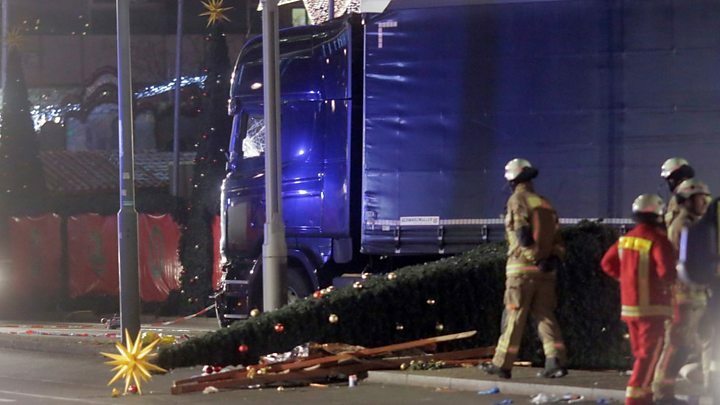 Image caption One eyewitness described seeing "blood and bodies everywhere"
The truck, which was loaded with steel beams, veered into the Christmas market at one of the most crowded times, crashing through wooden huts and stands filled with tourists and locals. According to the DPA news agency, police believe the lorry drove 50-80 metres (54-87 yards) through the market area during the incident, which occurred at 20:14 local time (19:14 GMT). A British eyewitness, Mike Fox, told Associated Press at the scene that the large lorry had missed him by only about 3m as it smashed through stands and tore down a large Christmas tree. "It was definitely deliberate," said the tourist, visiting from Birmingham. He said he had helped people who appeared to have broken limbs, and that others were trapped under Christmas stands. Australian Trisha O'Neill told the Australian Broadcasting Corporation she witnessed "blood and bodies everywhere". The site where the chaos unfolded is near a famous Berlin landmark - the Gedaechtniskirche, or memorial church, built in 1891-95. The church was damaged in World War Two bombing raids, and left as a ruin with a jagged tower as a monument to peace and reconciliation. A series of small-scale attacks by Islamist militants alarmed Germany earlier this year. Monday's incident evoked memories of the lorry attack on Bastille Day crowds in the French city of Nice on 14 July, when 86 people were killed. That attack was claimed by so-called Islamic State (IS). Both IS and al-Qaida have urged their followers to use trucks as a means to attack crowds. 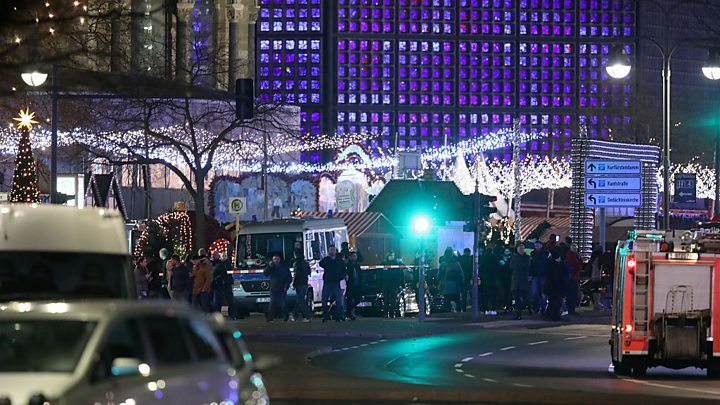 Reacting to the news from Berlin, Nice Mayor Christian Estrosi tweeted: "Horror in Berlin. Support for the mayor of Berlin and the German people. never again." The United States labelled the tragedy an apparent "terrorist attack" and pledged its support. President-elect Donald Trump blamed "Islamist terrorists" for a "slaughter" of Christians in the German capital. "Today there were terror attacks in Turkey, Switzerland and Germany - and it is only getting worse. The civilized world must change thinking!" he tweeted. Are you in the area? Did you witness what happened? You can email haveyoursay@bbc.co.uk with your experiences.